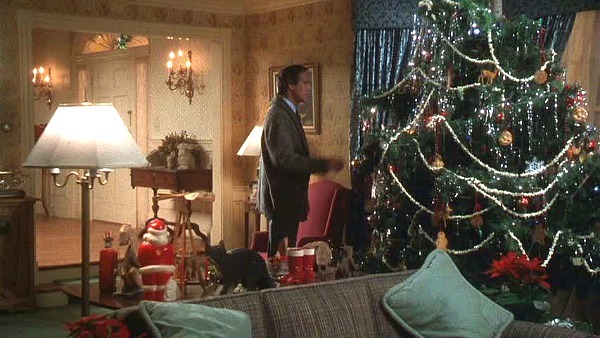 In National Lampoon’s Christmas Vacation, Clark Griswold (Chevy Chase) gets his wish for a big family Christmas. When his wife Ellen (Beverly D’Angelo) worries that it might not be quite as perfect as he imagines, he says, “Christmas is about resolving differences and seeing through the petty problems of family life.” He spends the rest of the movie trying to do just that! Christmas Vacation was based on a short story written by John Hughes called “Christmas ’59.” It was the second Vacation story to be published in National Lampoon’s Magazine (the first was “Vacation ’58,” the basis for the first Vacation movie). 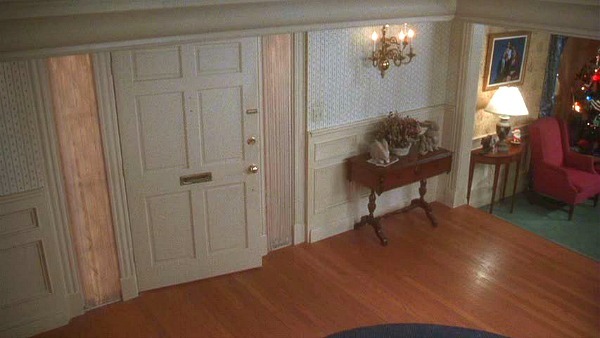 The movie premiered in 1989, and it shows in all of the wallpaper and fabric choices in the house. The movie was called National Lampoon’s Winter Holiday in the U.K. The exteriors were shot on the Warner Bros. back lot in Burbank. I love this bank of windows in the kitchen. We really loved plaid in the ’80s, didn’t we? 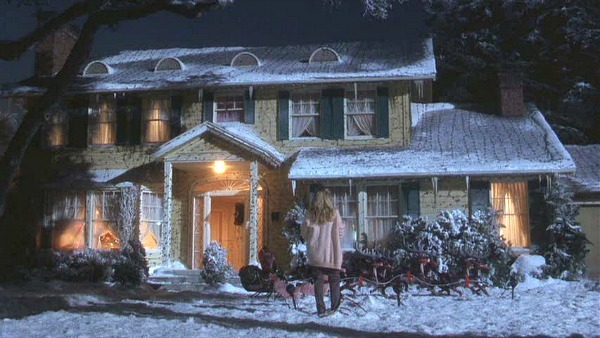 The Griswold house is actually an exterior set on “Blondie Street” on a Warner Brothers back lot in Burbank, CA, as is Todd and Margo’s house (the neighbors next door). 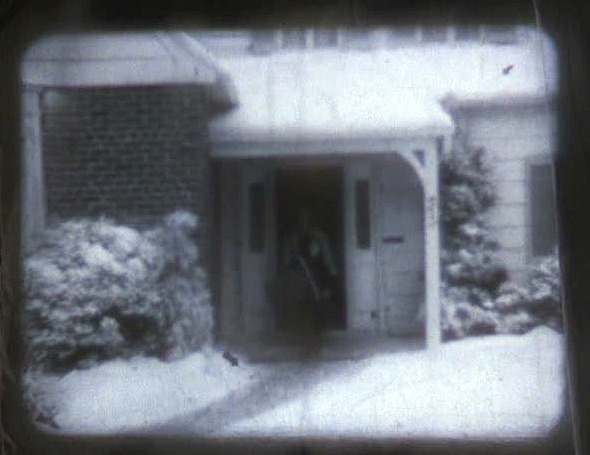 The house has been altered a lot to serve other movies, especially the interiors, which are also only a set, not a real house. 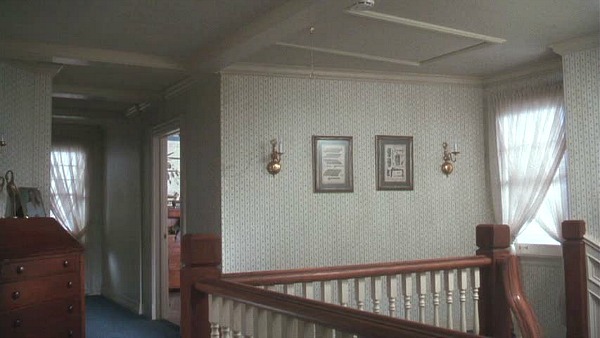 In one of the virtual tours on Warner Bros. website, you can see what appears to be the Griswold foyer set as it looks today (update: it looks like they’ve taken the virtual tour down). I took a snapshot to compare the two. You can see a photo of the exterior of the house as it looks today here. 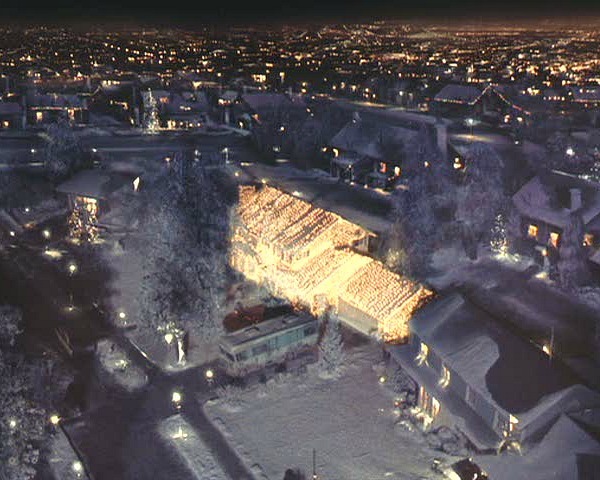 You can tell it’s the Christmas Vacation house by the two chimneys and the attached garage. Windows and colors and a few other things have been changed, however. 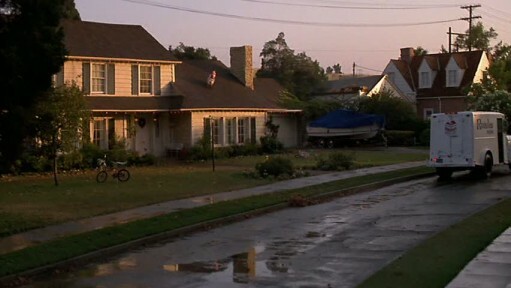 According to the Warner Bros. website, Blondie Street was built to look like a suburban neighborhood. It has also been home to many movies and TV series, including Pleasantville, Bewitched, The Partridge Family, and now The Middle. There are 12 residential homes on the street in a variety of styles. Here’s a close-up of Danny Glover’s house that I took from the first Lethal Weapon movie. To the right of it, you can see Samantha and Darrin’s place in Bewitched. The Inn from "Nights in Rodanthe:" Washing Away? 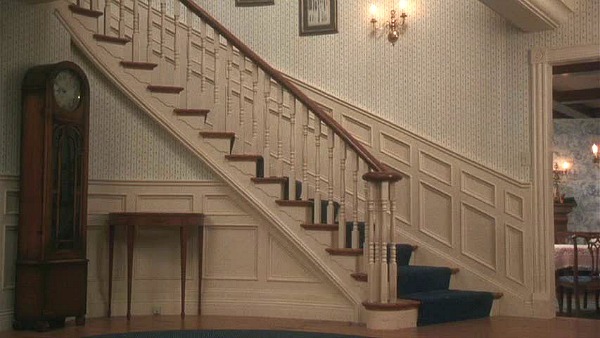 The staircase above must be the one used in Steve Martin’s Cheaper by the Dozen. Another great movie house! Love your site! Merry Christmas! I was 3 years old when this movie came out 🙂 Loved seeing the exterior of the house as it is today. Very cool. I have two posts up on Outerbanks oceanfront homes – thought you might enjoy them. Merry Christmas! .-= Joshua Cook´s last blog ..Southern Shores. Outerbanks 2008 =-. Its such fun to check and see so many new wonderful posts each week. You may want to look at the house in the new Sandra Bullock movie “The Blind Side”. The house is fabulous. Ahhh…Christmas Vacation and Funny Farm are my two all time favorite movies. I even searched to find those reindeer egg nog cups that Clark and Eddie drink out of, but alas….they ended up being too expensive. A big, big thanks for this one! 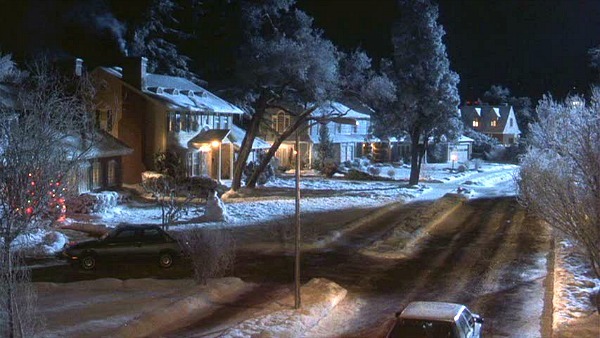 I always wondered if the Griswold’s was a real house or not. .-= Aprons Gone Wild´s last blog ..Turquoise Talent Apron from Aprons Gone Wild =-. I was hoping you would do this post for the Monday before Christmas. 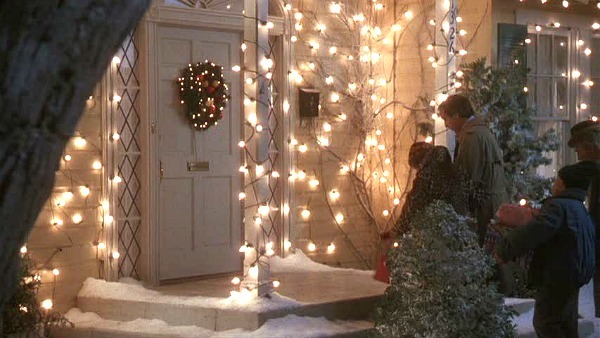 Every Christmas this movie comes on, I am in love with the house. I Especially love that grand staircase. I sure hope that they don’t make a sequel. Most sequels aren’t as good as the original movies or not very good at all. Wow – look at all the wallpaper in that house! I’m glad I didn’t have to take that down. I also never realized that Juliette Lewis was in that movie. I think we’ll be renting this one of Christmas Eve! .-= AnNicole@OurSuburbanCottage´s last blog ..Happy Birthday OSC! =-. My husband and I watch this over and over at Christmas, and on Christmas Day, Christmas Story is on ALL day, and in fact, the night before on Christmas Eve! Johnny Galecki was also on Roseanne. I hope they do a sequel and include Chevy and Beverly!!! In fact, it should be about the kids coming home for Christmas. I ADORE Funny Farm!!! One of the great Christmas movies too. I have a friend from New England, who I finally got to watch Funny Farm and she said that whoever wrote it sure knew what they were writing about when they addressed New Englanders!!! 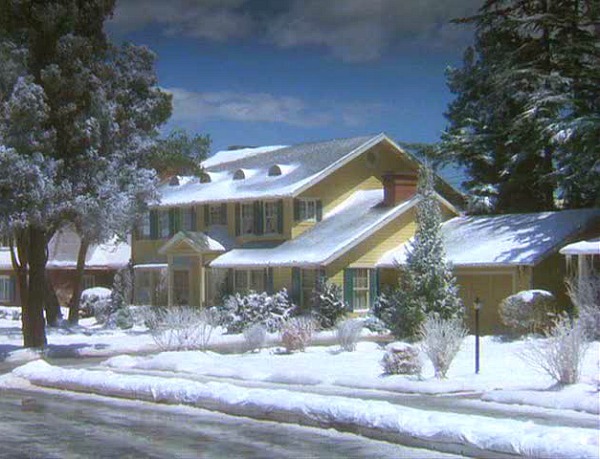 Thanks so much for sharing the story of the Griswold home from Christmas Vacation. It’s a hugely funny film that I think most of us can relate to, in some way. Christmas Vacation is due to be shown here in Sydney (again), tomorrow night – December 22nd, 2009. And I for one will be watching. Just watched this hilarious movie the other night. We were discussing that Bewitched house & it’s used for so many things. Have you seen the Fruit of the Loom commercial? Same house again. Thanks for giving us a tour of the Griswald’s – I always learn something from your tours. Enjoy your Christmas week. .-= duchess´s last blog ..The way it used to be. =-. This is my all time favorite movie! How fun to see the pictures and learn about it. .-= Jenny´s last blog ..The Christmas Sweater =-. I love that movie. It’s hilarious! .-= Jessica at Lavender & Lilies´s last blog ..Back to School… =-. .-= Sarah @ Thriftydecorchick´s last blog ..Ho! Ho! Ho! (A Santa craft.) =-. .-= Terry Kearns´s last blog ..White and Pointy – 80 years apart =-. Next to Funny Farm, this is one of my favorite holiday movies. Who doesn’t want the best holiday ever! 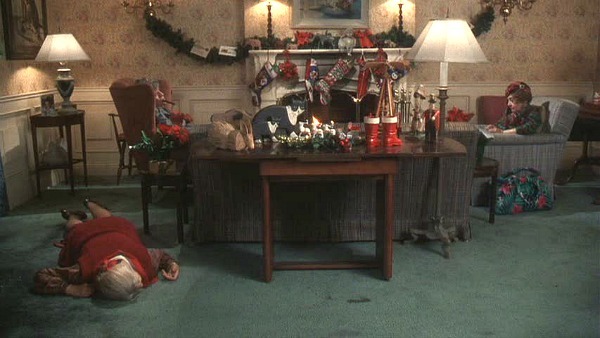 You have to appreciate Mr. Griswold’s attempt at creating the perfect Christmas. .-= JeanetteS´s last blog ..Views of snow fallen… =-. Always funny, I love these Holiday Films! Beautiful to see those lovely pictures! I think that I have to see the movies again this holidays! Thanks to your posts I will pay attention to the interior of this houses! .-= Greet´s last blog ..Last Minute Christmas Decoration =-. Christmas Vacation is one of my all time favorite movies. I still have to watch it at least once every year. Thanks for the post about the house, and the link to the Warner Bros backlot virtual tours! .-= Amanda – Small Home Big Start´s last blog ..Tutorial: Reusable Gift Bags =-. This is hands down my favourite movie, holidays or otherwise. 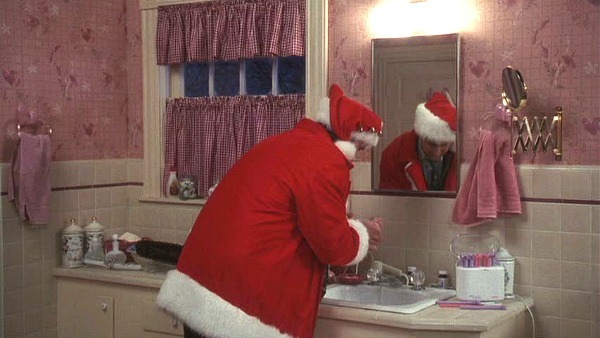 Christmas Vacation has become part of my holiday tradition, I watch it every year when I decorate my tree. I still laugh everytime and it takes me back through all of the past Christmas’. I can hear the echo of my Dad’s laugh in my mind when Clark kicks the Santa lawn ornaments around in frustration and for years we called my Mom “Sparky” because of her love of outdoor Christmas lights and how you could see a glow in the sky coming from her place, which I found embarrassing in my teen years and since come to appreciate and love. I have watched this movie at least five times just this year. It is one of my all time favorites. 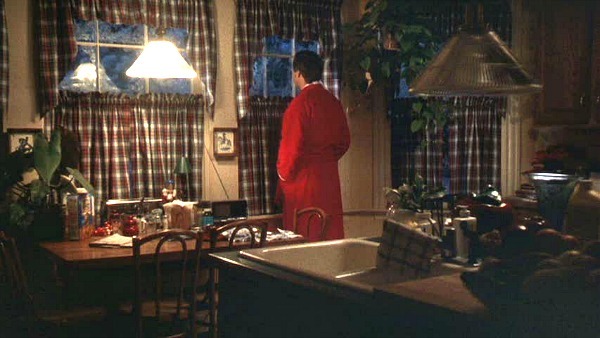 Those plaid curtains in the kitchen windows…. LOVE THEM! So homey and festive at the same time, they just speak Christmas to me! I was hoping you would do this one. Haven’t watched this yet this Christmas. I have it on DVD…must get it out soon. 🙂 The 80s decorating pictures sure take me back!!!! 🙂 I loved reading about the different houses on the lot! .-= Amanda @ Serenity Now´s last blog ..Last Minute DIY Gift Idea: Mini "Keyring" Photo Album =-. Your blog is one of my favorites!!! I love the look at movie houses. Thank you for all of the hard work you put into sharing these. Hope your Holidays are wonderful and your New Year prosperous. CLASSIC!! I watched it again Friday night and laughed so hard I cried!! I LOVE this movie!! Oh, and besides the decorating, how about that Ellen is wearing that night in the kitchen – with the black hearts and stuff on it?! I had one of those!! .-= Angela´s last blog ..Bless This Home =-. 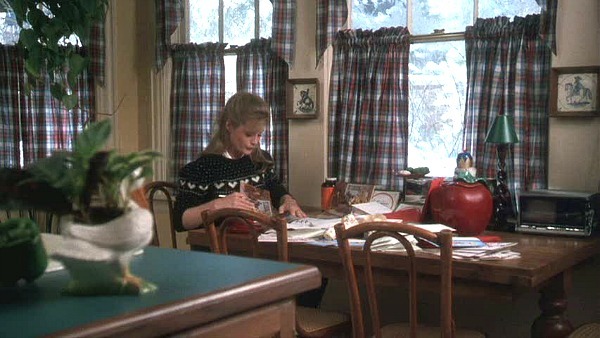 Julia, you’ve got me grinning just thinking about Christmas Vacation! It makes all of us laugh out loud every year. A little comic relief is a good thing any time of year, but especially at a busy time like Christmas. Thank you! .-= Richella at Imparting Grace´s last blog ..Catching up =-. Oh man, we have EVERY line to this movie memorized. What a great post – so interesting! .-= angela´s last blog ..To Do… =-. Gah! The research you do, knocks my socks off lady! I love Christmas Vacation and recently rewatched it as I am letting John Hughes movies acquaint me with my new adopted home of Chicago. In fact, a really superb restaurant just opened in my neighborhood called Kith and Kin inspired from the quote from this movie “The most enjoying traditions of the season are best enjoyed in the warm embrace of kith and kin. Thith tree is a thymbol of the thpirit of the Griswold family Chrithmath. ” Pretty groovy, huh? .-= Bailey´s last blog ..Addicted to Cute =-. Oh those Griswold’s just the name makes me laugh !!!! In case I don’t get by again this week Julia I wish you and your lovely family a very Merry Christmas….. I haven’t seen this movie in a while? .-= Stephanie´s last blog ..canvas gifts are shipping out … I gotta get some sleep =-. That was a great movie – and loved the post. 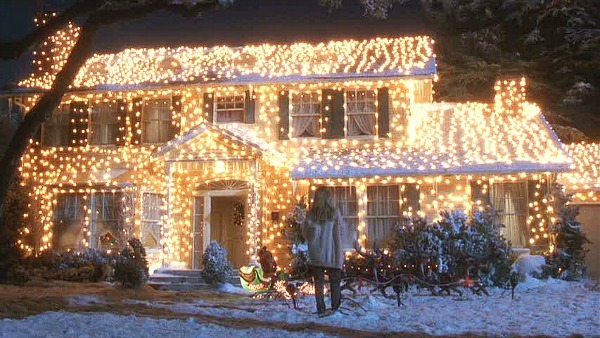 I would never be allowed to, but I would just LOVE to light my own house up like they did in that movie. So fun. .-= christy´s last blog ..Our Fabulous Family Reveal, Take Two =-. It is really hard to believe this movie is 20 years old?! I guess I am getting old too! .-= kayellen´s last blog ..Knock Knock =-. It’s so funny that you posted this. We just watched this movie the other day. I noticed the plaid curtains and the decor in the daughter’s room. I wanted curtains just like that but in pink when I was a kid. haha This is one of my favorite Christmas movies. Laugh out loud fun every time! Fun post! And I second the suggestion of Cheaper by the dozen, loved that house! .-= Michelle´s last blog ..Christmas Countdown Part I =-. Wouldn’t this house be fun to update! .-= Laura Ingalls Gunn´s last blog ..Pick me, pick me! Craft 7 =-. Someone said they were 3 years old when it came out… shoot me… I was 20! LOL This movie is such a wonderful classic. My family can so relate to it… think Rich and me and our parents and kids….. I swear it’s a script about us. Have a Merry Christmas Julia! .-= rue´s last blog ..Twas the night before Christmas… =-. There is a Christmas vacation 2. It was on the 5$ DVD rack at walmart. It is about uncle Eddie. Very funny film – my Dad made me watch a lot of the National Lampoon flicks a few years back. One of my favorite Christmas movies and one I look forward to watching every year! I still laugh every year, too! I love this movie! In fact, we watched it the other night and I was thinking that it would be fun if you did a post about the house. SO very 80s, but I have to say, I like the plaid curtains. .-= 50s Housewife´s last blog ..Fruit Swirl Coffee Cake =-. What a great post, Julia! I’ll have to show it to Tim. 1989 was a good year for us…we went to see our first movie together and it was Christmas Vacation!!! We love it still! .-= Kim @ Everything Etsy´s last blog ..Need a Gift…Fast? =-. 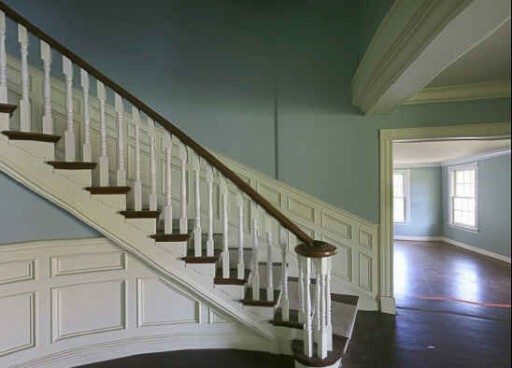 You know, it strikes me how similar this is to the Southfork downstairs set. I wonder if it’s the same with modifications. Is the green house in the background of the Randy Johnson Geico the same house? I believe it is because if you look at this video tour: https://www2.warnerbros.com/wbsf/virtualtour.html?virtualtour=blondiestreet, there’s the bewitched house and the yellow dorm window house used in the commercial. It’s the house used in Lethal weapon, just tweaked a little bit. Then click the second video tour and swing to the left. There’s the dorm window house again and next to it is the Christmas vacation house. They tweaked the outside of this house too. The house was also used in a Beverly Hills 90210 episode. Here’s the link: https://www.youtube.com/watch?v=rJUTT38DLAU go to 4:14. The inside is of the house next to it though. You can see it looks pretty much the same as the movie. At some point they changed the outside to what it is in the commercial. 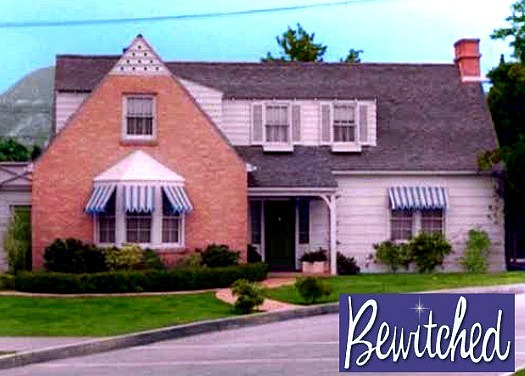 The bewitched house was seen in so many television and movies. I saw it on the t.v. series two and a half man whenthey took the young boy to catch a school bus. The house in the background of the Geico commercial is not the same house. Very similar though. 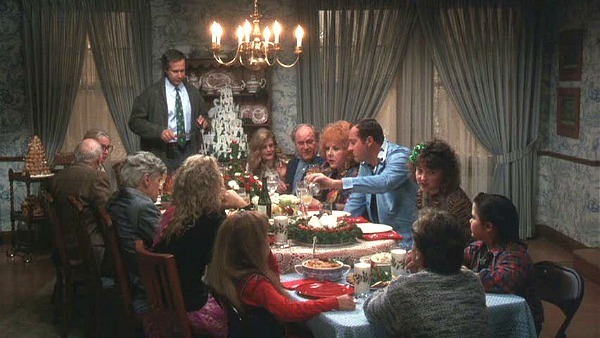 The Griswold is the same one used as a backdrop in the Geico commercial. The house has continually been changed for new uses since National Lampoon’s Christmas Vacation. The house was also used at the end of the Doris Day movie, With Six You Get Eggroll. The house is the one that Doris Day and Brian Keith buy after selling their two separate homes and merging their families into one new house. This is one of the best sites ever! I LOVED “Xmas Vac”! (sorry for the abbreviations; I’m British and we do that all the time). 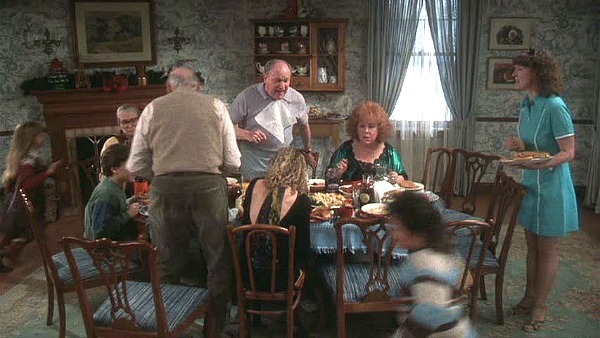 The Griswolds are the iconic, barmy, Yank family who TRY to do right (well, it’s mostly Clark, innit? ), but keep getting it wrong. By the time he’s done with it, the whole bee thing is all sixes & sevenses! It makes glad that Xmas is NOT as big a “deal” in England as it is in the States. I mean, if we don’t get out to buy the latest Nintendo fad, or whatsit, we won’t go round the bend, thinking we’ve ruined our kids forever. And if we don’t get on with our daft relatives (who DOES? ), then it’s no skin off OUR necks; we just say “THEY did it!” and all’s right w/the world. I LOVE the Todd and Margo characters–SO “Yuppie American Idiot”! And when Clark sends that giant piece of ice thru their window, wrecking that stupid stereo? Brilliant! You couldn’t plan a prank that good! But, despite Americans thinking (perhaps) that all Brits live in cozy cottages, like “Iris” in “the Holiday”, which weren’t real anyway, and what’s it to ya?…WHY do the houses in America all look the SAME? 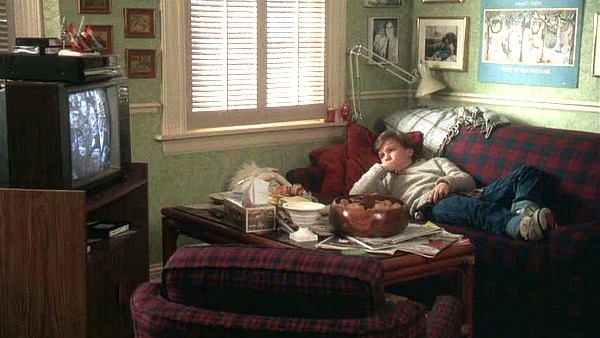 (at least in John Hughes flicks)? EH? You’ve got your fake, 2-3 story “Colonial” (lol) houses, all in a row, with the same things inside. (Don’t those burglars in “Home Alone” get bored?). 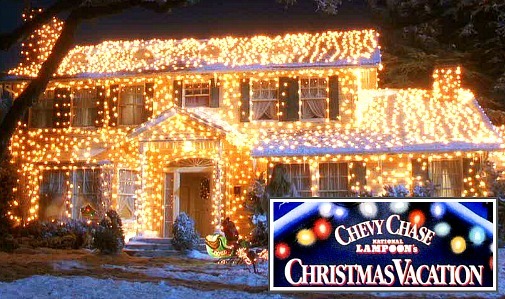 Anyway, despite living in one o’ those, Clark Griswold is QUITE the ‘original’! Props and cheers to him!